Single Cable Cameras Link (DVL SCCL). Coming soon! New product from the DV-Lab. Coming soon! 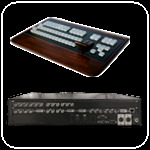 RING 22 – is first in a new line of professional video switcher. Format converters. What you should pay attention to when choosing a converter.